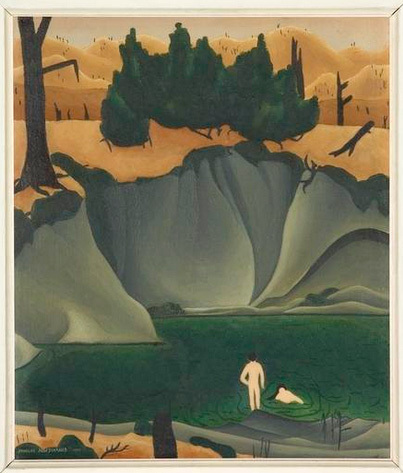 One of my favourite paintings in Ngā Toi | Arts Te Papa is a small oil by Douglas MacDiarmid – Papa cliff pool with bathers, Taihape. Whenever I see it, I’m struck by its clarity and intensity. Everything contributes to the sense of dream-like wonder: the emerald-green water, the sensuous curves of the cliffs, and the dusky golden glow of the hills. The naked figures – a New Zealand Adam and Eve? – are alone in this charmed spot, blissfully unselfconscious. This is a vision of the landscape as Arcadia: a place where the sun is always shining, nature is bountiful, and nothing ever really happens. What could have inspired it? Today, Douglas lives in Paris, his base for nearly 60 years. At 93, he is as witty and entertaining as ever, and the people and places of his early years in New Zealand still haunt his painting. He often speaks with gratitude of the encouragment he received as a young artist in Christchurch during the early 1940s. His friends included the leading painters of the time – Rita Angus, Evelyn Page and Leo Bensemann – as well as composers and musicians Douglas Lilburn and Frederick Page. The story of his love affair with Lilburn is told in Philip Norman’s marvellous biography, Douglas Lilburn: his life and music, published in 2006. Another vital figure in MacDiarmid’s life was the Wellington art dealer, Helen Hitchings. 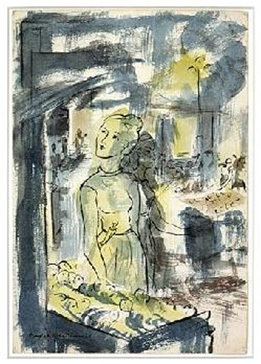 They met when he visited New Zealand in 1949, and he exhibited at her gallery in the following year before returning to France. You can see Papa cliff pool with bathers, Taihape in the top right of the photograph below; later Hitchings herself acquired it. 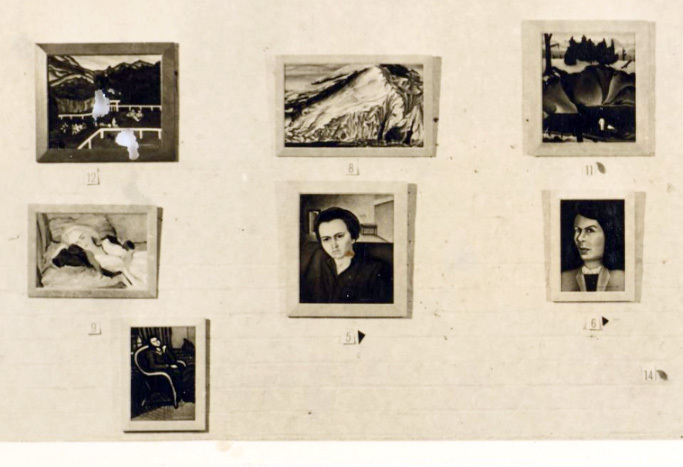 In 1952 Hitchings included MacDiarmid’s work in Fifteen New Zealand painters, the exhibition she organised in London – a pioneering attempt to show New Zealand art overseas. By then MacDiarmid was living in Cannes with a painter friend, and she hitchhiked all the way across France to see him. 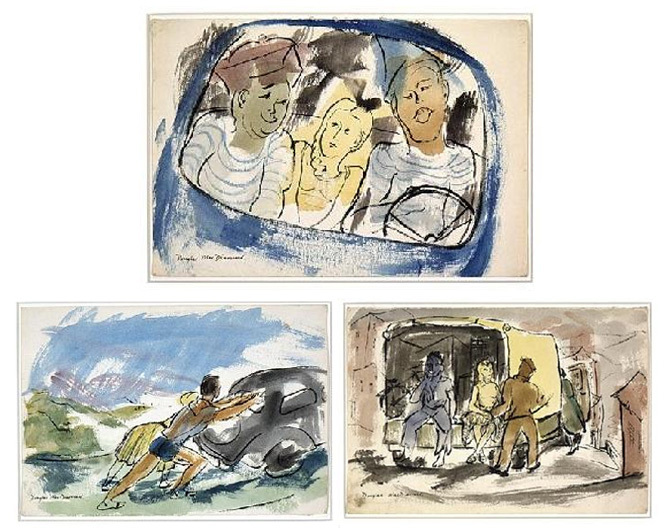 He made a series of watercolour sketches based on her adventures: Helen, perhaps having second thoughts, squeezed between two tipsy Frenchmen; pushing the car uphill after a breakdown; and catching a ride in a delivery van. Below, a stylish Helen peruses the offerings in an outdoor market. But what’s that attached to the waist of her skirt – could it be an ornamental dagger? You can find out more about Helen Hitchings and you will be able to learn more about Douglas MacDiarmid when his niece, Anna Cahill, publishes her forthcoming biography. Anna recently visited Te Papa on a research trip, and we’re looking forward to the results of her work. In the meantime, don’t miss Papa cliff pool with bathers, Taihape in the exhibition on the Gallery of Helen Hitchings in Ngā Toi | Arts Te Papa. The Gallery of Helen Hitchings is part of Nga Toi | Arts Te Papa, Level 5. Taihape Museum has a book about Douglas MacDiarmid which contains prints of a number of his works. It sells for $40. If anyone would like a copy please contact the email address above.